“A DREAM fulfilled” was how Brisbane’s German Silva described the canonisation of his friend and spiritual father St Oscar Romero last Sunday in St Peter’s Square, Rome. The Sunnybank parishioner expressed intense emotion and connectedness to his Salvadoran hometown, its people and their irreplaceable spiritual leader. Mr Silva was among an estimated 70,000 people in Rome to witness the historic yet personal celebration, including the canonisation of Pope Paul VI and five other saints. 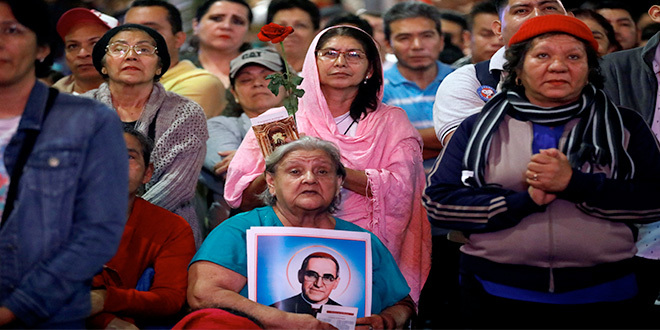 About 7000 Salvadoran pilgrims attended a Thanksgiving Mass after the canonisation, celebrated by El Salvador’s Cardinal Gregorio Rosa Chavez, who Mr Silva described as “the last living bishop and real friend to San (Saint) Romero”. “There are moments in our lives that define the rest of our existence,” he said. “In my case, the years working as a catechist with San Romero defined my youth and adulthood. “These days in Rome cannot possibly be expressed with words because the experience is again, deeply spiritual. Mr Silva said he was emotional because the image of St Romero stirred memories of others who were martyred for the faith, with the lingering question of why he was “spared”. “I saw San Romero’s picture, two days before his canonisation, and I began to cry out with all my heart,” Mr Silva said. “I not only thought of him but also the other priests, nuns and catechists (who were) assassinated by the death squads, the National Guard and the army of my country. “(There were) too many funerals to attend and too many tears during those years. Pope Francis spoke of St Romero’s courage in persecution, saying he “left the security of the world, even his own safety, in order to give his life according to the Gospel, close to the poor and to his people”. As a teenage catechist in El Salvador, Mr Silva also experienced danger and the threat of death when sharing the Word of God and Jesus in local and remote areas. This was expressed in a well-attended September 28 Ignite Conference keynote address in Brisbane titled, St Romero: A Story of Love for God and His people. Mr Silva said he was led by a humble “Monsignor Romero” who preferred not to be addressed with formality. “Normally, when you see an archbishop, it’s customary to say, ‘Your excellency …’ but Monsignor Romero did not want that,” Mr Silva said on September 28. As a catechist with “a good, solid Catholic formation” from his family and within Jesuit-led education from primary to university years, Mr Silva was drawn to lead sacramental programs for all ages, attending retreats and other encounters with St Romero. The archbishop spurred priests and catechists to action amid persecution. “Monsignor Romero helped us catechists understand that we were the Church,” Mr Silva said. Mr Silva and a dedicated ensemble of other catechists travelled consistently to remote and poor locations, certain inspiration for spiritual and emotional maturity at an early age. 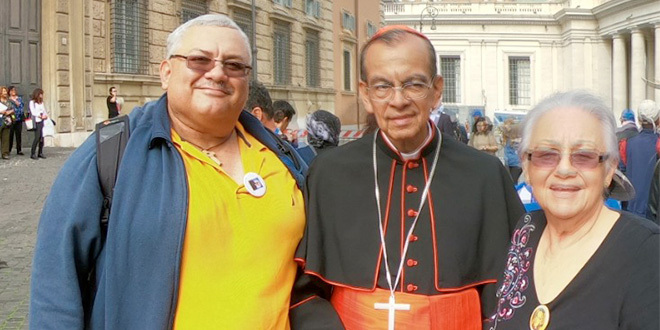 Blessed reunion: German Silva (left) with Cardinal Gregorio Rosa Chavez of San Salvador, El Salvador, former Caritas secretary Miriam Estupinian and other catechists in Rome. “We knew we had to continue the role of our priests,” Mr Silva said. “(And) this is a maturity that you can only find in persecution because faith is tested. Mr Silva described what he and other catechists were up against as “a battlefield”. “National security labelled everybody as an enemy of the state and the enemy of the state had to be eliminated,” he said. “They started forming death squads who would go to rallies and take photos of those to be eliminated. Mr Silva said he had an escape route if the death squad came unexpectedly in night hours. “I lived with a ladder and as soon as I heard a noise, I had to run, to go on the ladder, to go to the next house and run for my life,” he said. Of the group of 15 catechists with whom he ministered, nine lost their lives in the pursuit of holiness. He said as young leaders and catechists they were targeted because they were “seen as a threat”, promoting Salvadorans’ “dream of justice”. While visiting a remote and poor village, Mr Silva had an encounter he will long remember, not dissimilar to other catechists near and far. “We were forming a very committed parish in this particularly poor area,” he said. “We were working to maintain the Church and the local priest would give us the consecrated host to take back to the community. “When we finished the catechesis for that community, we were going down the hill. “The hill was countryside and we had to go through the road. We went to the curb and all of a sudden, a man, about 50 or 60 (years), came out of nowhere and said to us, ‘Don’t go this way, they’re waiting for you further down’. “I said, ‘Thank you’ and we took an alternative route. Certain of having avoided death, the group returned a week later to express gratitude to the stranger but he was not to be found. “The first thing we did, when back in the community, was describe the man and said that we wanted to see him, to thank him for saving our lives,” Mr Silva said. “But no matter what we did, the man was not in the community. They told us this man did not live there. “This circumstance happened all over the country. “It is my belief, along with many others who experienced this, that the man was an angel, sent by God, to help us. God sent him at the right time and in an area where there was no one else. Mr Silva said those years of peril in the late 1970s and beyond were met with St Romero’s encouragement, saying “he visited so often to give us the strength we needed to continue … he never stopped”. Their last conversation was about six months before St Romero’s assassination, at a youth retreat. Now, the father-of-two and new grandfather ponders how he “did it”, concluding, “God was looking after us”. 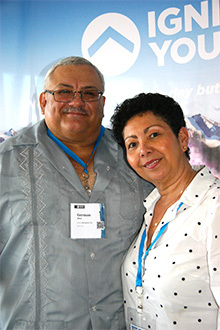 At 18 and because of a shared interest in helping those facing persecution, Mr Silva met his future wife, Gloria. They were together when the news of St Romero’s death was broadcast on March 24, 1980. “I was coming from my work as a catechist and Gloria and I were dating,” he said. “I picked her up and we were waiting for the bus. Everyone kept saying, ‘They killed Monsignor Romero’. We said, ‘We can’t believe it’. “We were walking in front of an electronics shop and we could see the news on the TVs in the window and we could see that it was true, they did kill him. “We cried … (and) with all my heart I can tell you that I felt that day, exactly what I felt when my father died. That’s how deep was my pain. Mr Silva said he and Gloria were quick to return to their home parish of St Lucia where a new parish priest from Nicaragua had been appointed. “Everyone ran for the church asking what was going on,” he said. “Everybody was crying and hugging and we said we needed to do something. “The new, young priest was in despair. We told him not to worry. We formed a group of houses in our parish so he could go and sleep every night, in a different house. 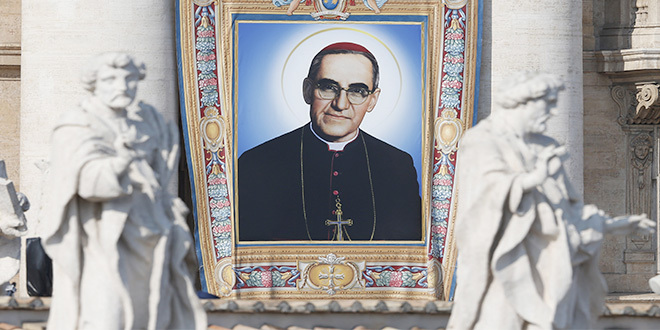 Of all the key messages St Romero imparted, Mr Silva holds firm to the newly-canonised saint’s belief in the value of lay people in the Church. Being “true to yourself” is another. “Monsignor Romero told me that you have to be true to yourself and what your conscience tells you because it is in your conscience that God is waiting,” Mr Silva said. “That message has been very important in my life because I have never ever kept silent when I have seen something that I don’t like. “This has gotten me into trouble sometimes but this is what he taught us. “Monsignor Romero said a true Church is the one that is persecuted … (and) if the Church is not persecuted, that means it is not producing any conscience of the heart of the people. 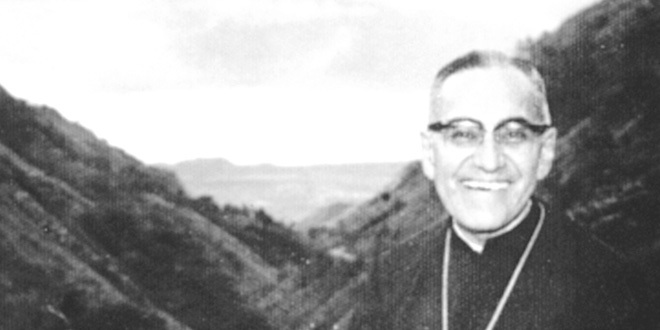 Mr Silva said that St Romero encouraged all to consider “going along in a merry way” means “not confronting hearts… (and) that is not a true Church”. A teaching about the Cross of Christ also remains vivid. “Monsignor Romero asked us to consider the one vertical and one horizontal beam of the Cross,” he said. “He explained the vertical beam teaches that in everything we do, we have to look up in prayer and not get lost in the busyness of life without moments of silence and prayer, dedicated to God. “The horizontal beam represents God embracing us with His death. The Brisbane pilgrim’s intense emotion continued when realising Pope Francis, at the canonisation, wore a chasuble and cincture used by St Romero, remaining ever-grateful for the Holy Father’s oversight of the process towards sainthood. “In El Salvador, we say that God, in His infinite mercy, inspired the cardinals to choose Pope Francis as pope because He, God, wanted to see Monseñor Romero canonised,” Mr Silva said. “To see the bloody cingulo (cincture) of San Romero as part of Pope Francis’ vestments during the Mass, was incredible and to see our Holy Father … embracing Miriam Estupinian (the Salvadoran secretary of Caritas, appointed by St Romero) was simply too much. 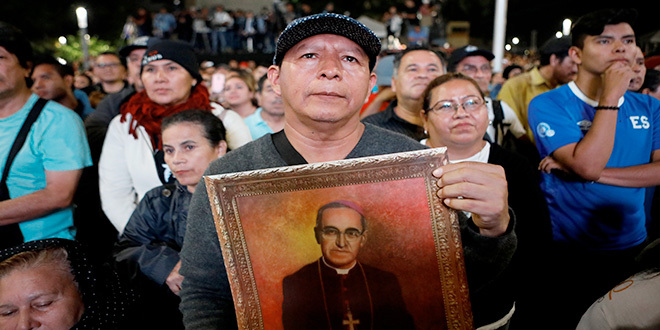 As the 7000 Salvadoran pilgrims return to their homes, Mr Silva said Pope Francis inspired them to take with them “the merciful heart of St Romero”. “(Pope Francis said) to forgive those who have wronged you but also to fight for the cause of justice and human rights in all your societies,” Mr Silva said. “God has totally fulfilled my dreams and gave me the answer to the question I have had in my mind from those years until now,” he said.